To coincide with our current book display in the library this post takes a closer look at one of its stars: Jane Haldimand Marcet. Jane Haldimand was born in London, 1769, to an English mother and a Swiss father. Her mother died when she was 15 leaving her to run the family household. This involved arranging the education of her younger siblings and organising her fathers evening soirees. She studied painting with Joshua Reynolds and Thomas Lawrence and used this skill when later illustrating her own books. She married the physician, and later lecturer in chemistry, Alexander Marcet (1799-1822), with whom she had 3 children. Jane came into contact with various scientists and intellectuals of the day including Humphrey Davy, Edward Jenner, Thomas Malthus, Maria Edgeworth, and Harriet Martineau, becoming personal friends with a number of them. She authored around 30 books, some running to numerous editions, and died in London in 1858. 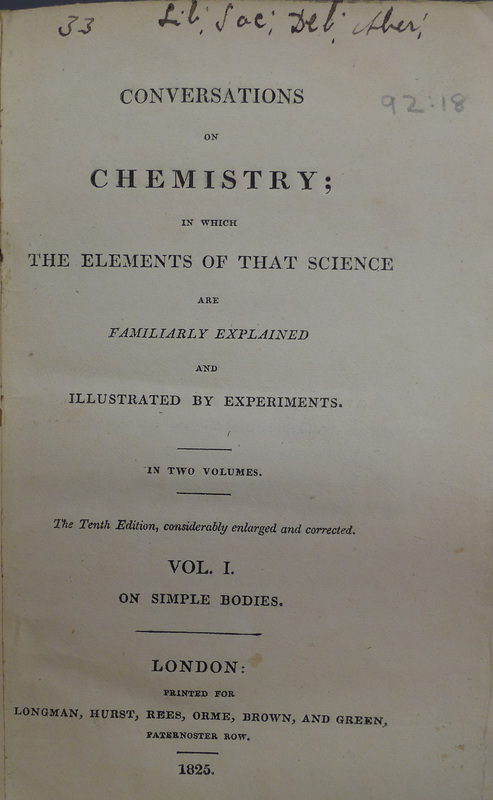 The first book Jane published was Conversations on Chemistry in 1805. This book and some of her other early works were published anonymously. In the preface to the tenth edition, which we have at the Whipple, she states that she was apprehensive about publishing partly due to her being female and because of her “imperfect knowledge”. The book features Mrs B., a motherly governess type character, and her 2 students Caroline and Emily. These characters appear in a number of her other books, while in others they are replaced with similarly eager to learn students. Jane gained the information she needed for her books by attending demonstrative lectures at the Royal Institution and, for Conversations on vegetable physiology, the lectures of Augustin Pyramus de Candolle who was a Swiss botanist. Her husband had a chemistry laboratory built in their house so she was able to test out some of the experiments with him and had her scientific friends to write to for guidance. Although she began writing books of a scientific nature, she did move on to other topics including language and grammar, the history of England, and religion. Another subject Jane wrote about was political economy. Shackleton notes that, along with Harriet Martineau, she was one of the “best-selling English economists of the first half of the nineteenth century” (p. 283). She also wrote a number of children’s stories including a book about the adventures of Bertha who travels from Brazil, where her father was working, to stay with her uncle in England. She writes letters in the form of a journal back to her mother describing life in England and tells her how she is improving herself by learning about animal and plants, different countries and history, and about the bible. There is, however, some confusion over a few books that have been attributed to Jane. 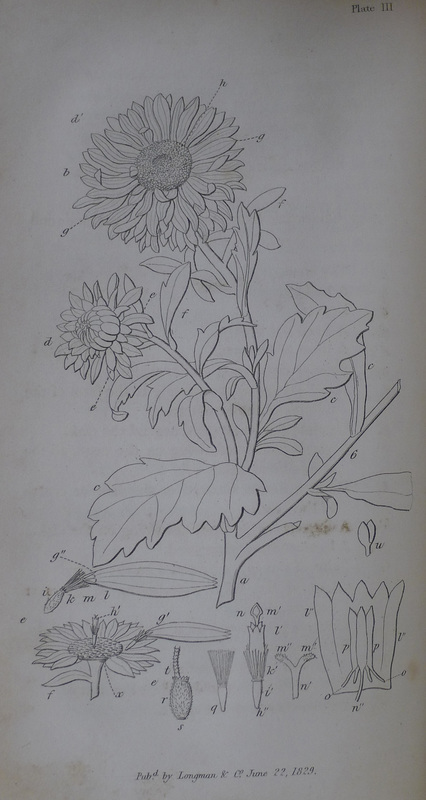 Conversations on botany was published anonymously in 1817 by Sarah and Elizabeth Fitton. It has probably been credited to Jane Marcet as the authors state in the preface that they admired the author of Conservations on Chemistry and both books were published in the same series. Conversations on mineralogy is listed as a work by Jane Marcet in Polkinghorn’s biography of the author. However, there are no records on Copac or World Cat that link this book to Jane. The book itself, a copy is available via archiv.org, has Delvalle Lowry on the title page with the date 1822. The preface refers to the success of Conversations of Chemistry and states that this is why the author has selected to use the format of conversations. It has been noted by Shackleton that Jane’s books were widely plagiarized in the United States and confusion about who authored them was rife possibly leading to the confusion. Jane was a very successful writer who continued to edit her book well into her 80’s, new editions of a few of them were even released after her death. Shackleton concludes that she had a secondary role as a popularizer but had she been working in a different context her work could have led to “genuinely creative work”.